Hoe and Shovel: Are You Ready For Fall? I know I am eager for that first true Florida cold front. It's been a long, endless summer this season. I'm ready for less humidity and cooler temperatures. I can hardly remember what it feels like to garden without pouring sweat. 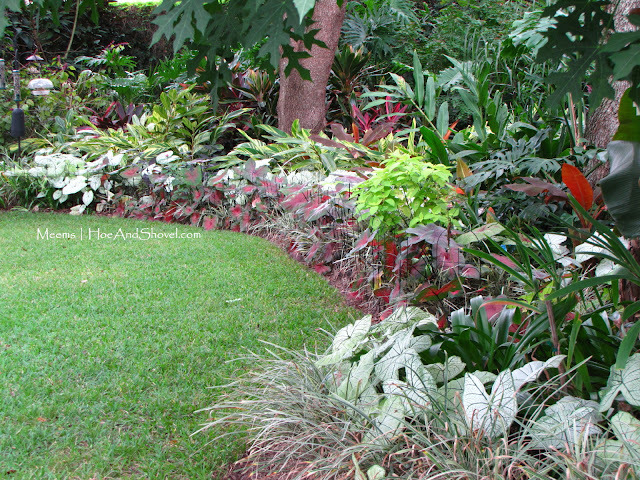 'Postman Joyner' caladium, 'Siam Ruby' ornamental bananas, variegated shell ginger (Alpinia), and Cordyline in back garden. The change of seasons doesn't necessarily mean a change in fall foliage in this part of West Central Florida. These are the colors my fall garden is displaying this year. I know, it's kind of like cheating since these are the original colors of these foliage plants. We just have to make due sometimes and this is how I do it for fall and now that I think about it for spring and summer also. 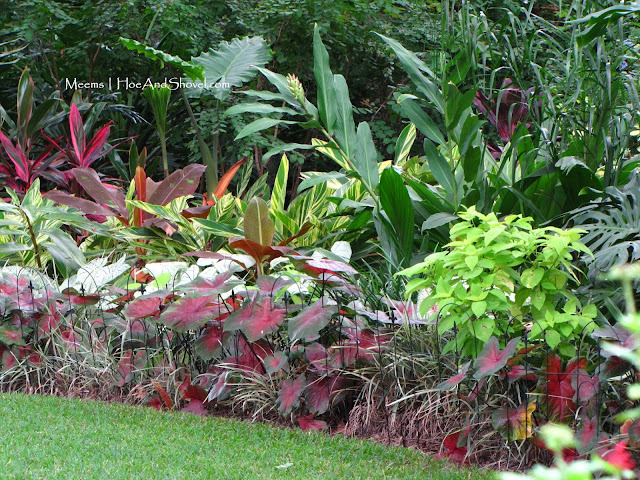 What are some of your favorite fall foliage plants? As always your gardens are beautiful and inspiring to me. I am also ready for cooler weather. Oh how FUN to find another Florida gardening blog (not that mine is all garden...) Yes I am SOO ready for Fall!! And today was/is hotter than most! Whatcha workin' on??? Inspire me to get out in my jungle! I am in Central Florida but all my caladiums have disappeared until spring. I posted a few "fall looking" plants. I can't believe how beautiful and full your caladiums still look! Everything's just perfect! I am READY for Fall! My flowers already have made the transition: swamp sunflowers, Mexican sage and goldenrod are in full bloom! So mamy wonderful fall-blooming wildflowers.. And the mockingbirds are enjoying my purple beautyberries. I am so looking forward to being able to sit out on my deck or porch without melting. Isn't fall just the BEST?! Knowing I can garden midday if I choose is such a welcome option! Enjoy! It was wonderful to step outside today and feel the cool air. It definitely makes me look forward to getting out in the garden more. Enjoy! So beautiful, Meems! I love your caladiums! We're not lucky enough to get cooler temperatures any time now. We'll have to wait for end-december for that.